Halloweek: Horror Heavyweights Share Their Biggest Fears and Favorite Scary Movies! 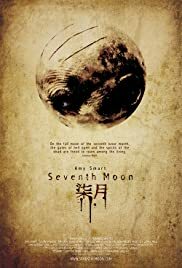 Part of the Ghost House Underground DVD series, Seventh Moon is based on the Chinese legend that on the full moon of the seventh lunar month, the gates of hell open and the dead can enter the realm of the living. The film opens in China where we are introduced to newlyweds Melissa and Yul (Amy Smart and Chiou) as they walk the streets of China acting as regular and normal as any tourist – taking in the culture and enjoying the ethnical differences. When Melissa and Yul are left by their guide, Ping, in a remote ancient village, their night of terror takes them through puzzling occurrences and face to face with some ghastly creatures. As with most horrors, the tension and the events that lead to eventual terror takes time to build. It starts with their car being splattered with blood while the couple were investigating outside of the village. Smartly, the couple don't' try and stay to figure out why they were targeted. Instead, they get in their car and try and hi-tail it out of dodge. But when a mysterious figure runs in front of their vehicle driving them off the road, Amy and Yul are soon on foot trying to evade the deadly beings that are in pursuit. Seventh Moon is directed by Eduardo Sánchez who directed The Blair Witch Project in 1999 and the under appreciated Altered in 2006. Sánchez emulates his Blair Witch debut by shooting Seventh Moon with hand-held cameras and quick edits. This can get awfully annoying if you are not in the mood for unsteady camera work. Although the atmosphere and the intense mood of the film gets high marks, the film fails by not offering anything new to the genre. Spooky as it was at times, the shaky camera doesn't allow the audience to get to know the characters as well as a steady-cam. It is bad enough that the setting all takes place at night where visibility is poor to begin with. Couple the setting with the constant shaking and un-centered camera efforts, and there isn't any time for emotional investment amongst all the other distractions to care whether the two leads live or die. The first half being watchable and the second half evoking a 'please-hurry-I-have-things-to-do' response, Seventh Moon (which copied way too much from The Descent) is just average. And in this genre, that just doesn't cut it.